I had some time to work up a new map which expands the number of hiking trails at Pleasant Valley Conservancy. I did the map in ArcMap 10.2, taking the opportunity to use some tools I hadn't used before. The new techniques provide for more sophisticated labeling (among others things). Two long trails that hadn't been shown before are the North and South Firebreaks (now labeled) which get into areas with nice tall oaks. Since we keep these open all the time, they should make nice shady strolls. The map can be downloaded (PDF) from this link. Pleasant Valley Conservancy is in the midst of the hill country of the Driftless Area of Wisconsin. 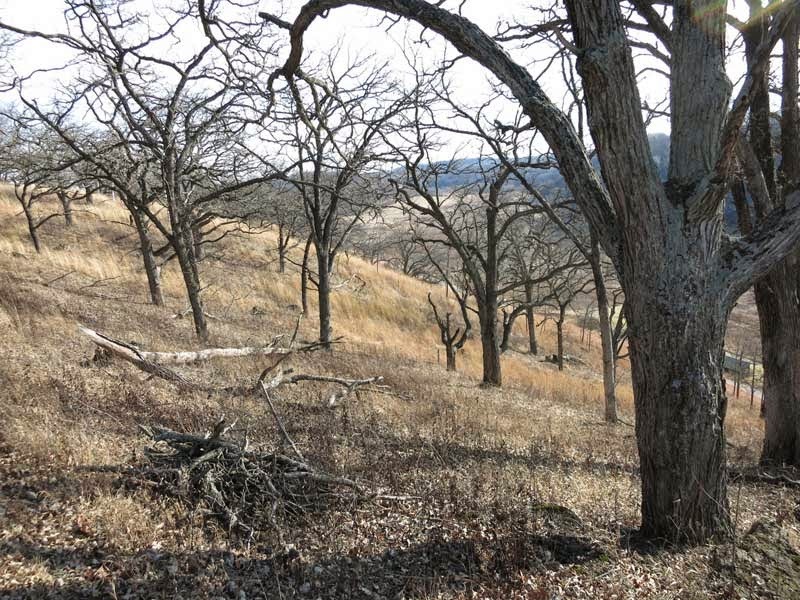 We have a fine and extensive bur oak savanna on the upper part of our south-facing slope. Since bur oaks are known for their fire resistance, it seems reasonable that their presence here relates to historic fires that took place in this area. bottom of the hill and just allowed to burn. (Throw out a match and then go in for supper.) Depending on the conditions (fuel moisture, wind, R.H., topography) the fire could move quite rapidly. In this hill country, flame height depends more on topography than on any other factor. Even in the absence of wind, flame heights can be high (10 feet or more) and rate of spread can be rapid (50-100 feet per minute). You don't want to get near that sort of fire! However, because of the linear shape of these "burn" units (see the air photo below), most of the fire would be a flanking fire getting ignited from either side of the original headfire. It makes sense that the bur oaks on the upper part of our hill are the ones able to survive these vigorous (probably annual) fires. The upper slope is dominated by numerous open-grown bur oaks. The fuel here consists primarily of warm-season (prairie) grass, which burns very hot. When we first started burning our south slope in 1998, it burned very poorly. We could only get it to burn as a headfire. Since the fuel was light, this was a relatively gentle headfire and was very easy to carry out. We simply burned in fire breaks around the edges and then lit from the bottom. As the years went by the burns gradually got better. Then suddenly in 2005 the burn situation changed. We stood at the bottom of the hill and watched amazed as the fire roared up the hill with 10-15 foot flame heights. The whole burn was over in a few minutes. Snags and dead trees burned. Even some living bur oaks caught fire. But almost all of these living trees survived the fire without any significant damage and are still thriving. This was probably the sort of fire the original landowners experienced every year. Where our terrain is less steep, many of the oaks are white instead of bur. These are areas that burn less hot. 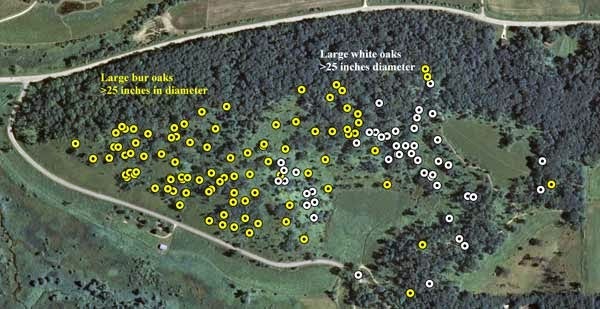 The photo below shows the distribution of the bur oak (yellow dots) and white oak (white dots). 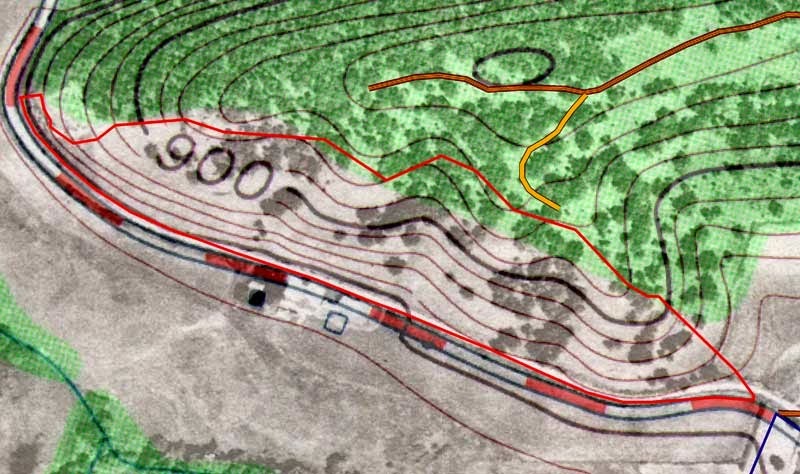 Note that all the large oaks on the south-facing slope are bur oaks. Corylus americana: an invasive shrub? 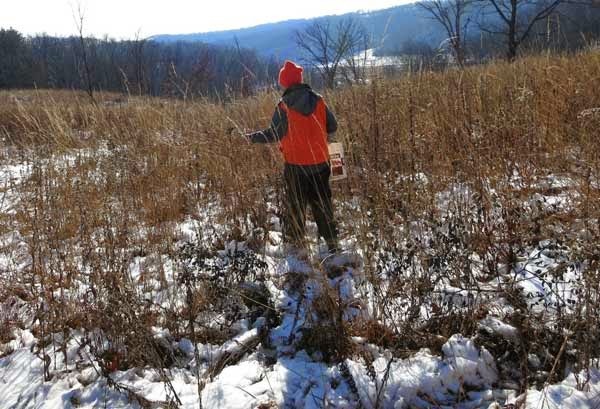 During our early savanna restoration work, based on the prevailing sentiment in southern Wisconsin, we either ignored hazel or allowed it to grow, in some cases even encouraged it. Now we realize that this may have been a mistake. Although it grows rhizomatously, its rhizomes only grow a short way before they send up new shoots. Thus, in contrast to sumac, gray dogwood, and prickly ash, hazel often grows as tight, compact bushes. A single bush like this may remain compact for a number of years, although its duration in this well-behaved capacity is unpredictable. Under some conditions a single hazel bush may turn into what is called a “hazel thicket”. A survey of the literature reveals a number of mentions of “hazel thickets” associated with either prairies or savannas. Thus, hazel “can” become a problem, although the conditions leading to this situation are not clear. At any rate, it seems obvious to me that it would be foolhardy to allow hazel to “run amok”. At Pleasant Valley Conservancy I have been seen several sites where hazel seems to be getting out of hand. At the south side of Toby’s Prairie, in a former aspen zone, hazel has been spreading even in the face of annual fire. It has also spread extensively in some areas of the White Oak Savanna (Unit 12A), also burned annually. Both of these areas seem to have the potential of becoming bad, so we are killing them this winter by Garlon basal bark. On the other hand, there are several hazel bushes along the margin between the Ridge Prairie and the East Basin that seem to be well behaved. They were left ten years ago when we cleared all the honeysuckles away, and although they have bulked up they have not spread. These are savannas. How about prairies? Here I think it depends upon the history of the site, what I call the “legacy”. At Black Earth Rettenmund Prairie, where hazel was present before restoration work began, there is a large hazel clone on the Saddle that has survived dozens of prescribed burns. 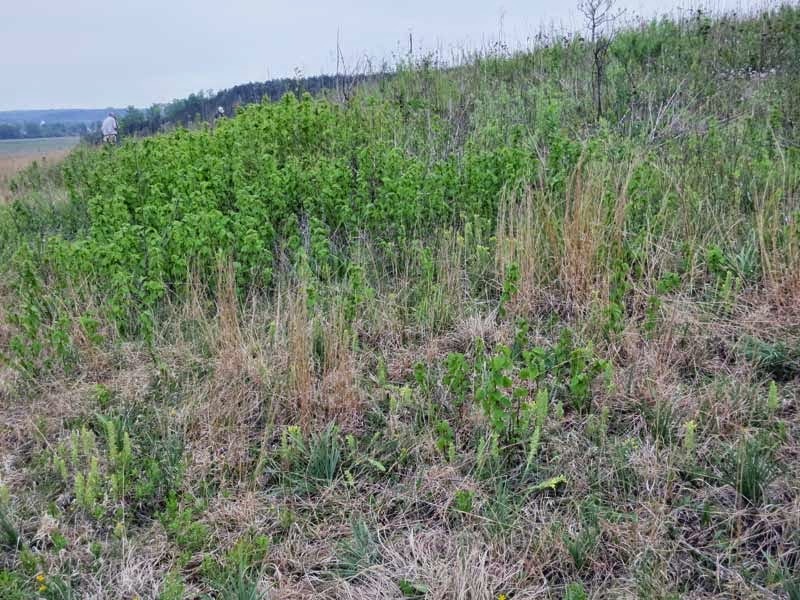 Also, on the knoll at the top of the North Unit, where the woodies formerly consisted of prairie willow and sand cherry, both relatively benign, in 2012 many clones of hazel appeared. Even more disturbing, they were not only spreading rhizomatously, but were sending up suckers (see photo). In this clone I counted over 350 shoots. Given these conditions, it seems reasonable to control the hazel, and this is what we are doing. New shoots of a hazel clone spreading away from the main shrub. We have known intuitively almost since we started our savanna restoration work that we were benefiting wildlife, especially songbirds. Now there is some quantitative research that confirms this. The work was done by wildlife biologists Frank Thompson and Sybill Amelon and their students at the University of Missouri-Columbia and summarized in the U.S. Forest Service Northern Research Station website. The approach used was to contrast the use by birds and bats of actively restored savannas with unrestored sites that were now closed canopy forests. The work was done in sites in Missouri, Arkansas, and Tennessee. The results showed that blue-winged warbler, Eastern towhee, Eastern wood pewee, field sparrow, prairie warbler, and summer tanager were more abundant in the restored sites, whereas Acadian flycatcher and worm-eating warbler were more abundant in the non-managed sites. The conclusion was: "Savannas and woodlands provide habitat for a diverse mix of grassland-shrub and canopy nesting birds that are of high conservation concern." Parallel work was done on bats in the Missouri Ozarks by Clarissa Starbuck, a student of Thompson. See concluded that: "Habitat conditions created by savanna and woodland restoration and management resulted in greater occupancy of the big brown bat, eastern red bat, evening bat, and tri-colored bat than was observed in mature, non-managed forest. The northern long-eared bat, however, had greater occupancy in highly forested landscapes and closed canopy forest or woodlands with open understories." Our work at Pleasant Valley Conservancy has shown that plant species diversity is also higher in the savanna than in either the prairie or woodland habitats. A scan through our detailed species list will confirm this, The complete list of savanna species can be found in this link. 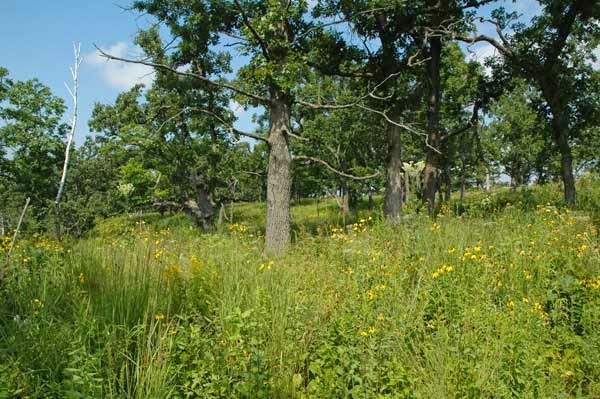 Here is a quote from our oak savanna web site: "Because the open canopy means that light can get to the forest floor, the oak savanna has a wide diversity of grasses and other flowering plants. Because the habitat is so variable, there is more diversity in savanna than there is in prairie. In 2004, 184 species of flowering plants were identified in the oak savanna areas of Pleasant Valley Conservancy. The list to the right, an aggregate of years 2002 to 2007, has 275 species. However, not all species were present in all savanna areas." With this great vegetation diversity, it seems reasonable that wildlife of all kinds of species would benefit from a restored savanna. So far this year things seem favorable for winter work. No significant snow and not too cold. Most of the seeds are planted but Kathie still has some special species to get on the ground. Today she's planting yellow pimpernel, a fine savanna species that is not too common. We have a couple of native populations but fairly small, so we are trying to enhance the population. She is kicking the seeds in at the west end of Unit 10. She also has purple milkweed seeds to plant, and these will probably go into the bur oak savanna. I'm trying to avoid areas where large populations of woodland sunflower might invade, as this species grows in such tight clones that nothing else can become established. Another one she's planting is wood betony, a hemiparasite that plays an important role as a keystone species. Originally we just had it in a few spots, but through judicious planting we now have it in quite a lot of areas. The main program for now is brush control. As long as snow is scarce we cut and treat or basal bark shrubs. One important target are the numerous oak grubs, which we find not only in the savannas but also in those prairies in which there is a woody legacy. This is a good time to spot them as they still have their leaves. Basal bark with Garlon 4 in oil is the most efficient way to deal with them. Winter came early this year, but fortunately the snow was light enough so our crew could get out and plant. Since most of our habitats are already fairly well established, our work consists mostly of "overseeding", adding new species to existing prairies. Here Kathie is planting the Ridge Prairie and East Basin with lupine and a few other species that like the sandy habitat we have at this end of our Conservancy. We often get queries about the best time to plant. Some folks think you should only plant after a burn, when the ground is bare. However, it depends on the habitat. Prairies are different than savannas. Early winter is an ideal time to plant species that need cold moist stratification. When you look at this planting site you might wonder if the seeds will reach the bare ground. 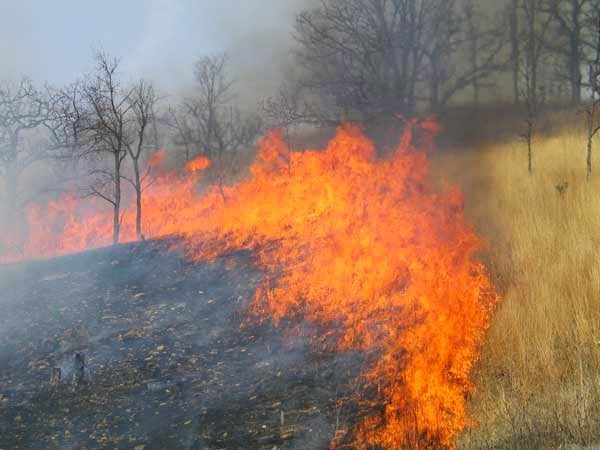 However, discussions with some of the most experienced prairie restorationists have convinced us that this site is fine for planting without a burn. Why? This site is burned annually, which means that there is no residual prairie thatch (see my recent post on this topic). Thus, the ground is mostly bare, so the seeds can get to the surface. The winter's snows, and lots of freeze and thaw, should work them into the soil. The same situation doesn't exist for oak savannas. The leaves come down in the fall so the ground is now covered with leaves. For overseeding we plant the oak savannas in the early spring, just after our spring burns. 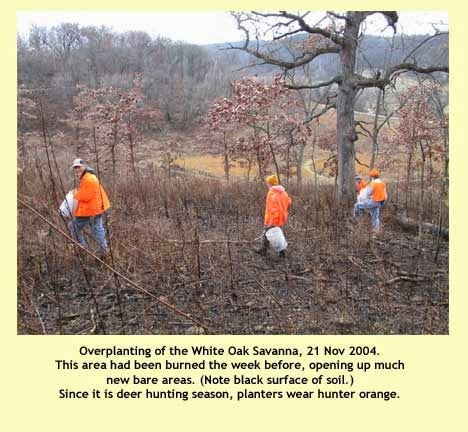 However, back in 2002-2005, when we were planting the oak savannas for the first time, we burned in the fall and then planted, as the photo below shows.